Shangri-La Rasa Ria Resort and Spa | Borneo Trails Tours & Travel, Sabah, Malaysian Borneo. It is dawn, and you are seated in a tower as the majestic new sun rises over Mount Kinabalu in the distance. This is the best breakfast you have ever had. 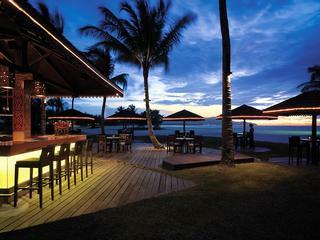 This is Shangri-La's Rasa Ria Resort & Spa, Kota Kinabalu on Pantai Dalit Beach. Set amidst a nature reserve, the resort enchants endlessly with its natural magic. Garden Wing Superior Rainforest View Rooms offer luxurious accommodations with traditional highlights, such as warm earthy colours and natural wood furnishings. Rest and relax on the Garden Wing Deluxe Garden View Room balcony. With your choice of a room on the ground floor or high floor, enjoy a birds-eye view of our meticulously-manicured garden or easily explore the gardens via the personal pathway, a special feature for the ground floor rooms. The spacious, Malaysian-inspired Garden Wing Deluxe Sea View Rooms face the beach and the South China Sea across landscaped gardens. Located on an upper floor, Garden Wing Executive Sea View room offers an unobstructed view of the South China Sea. Garden Wing Executive Suites offer abundant luxury with an inviting décor inspired by Sabah's rich cultural heritage. Garden Wing Speciality Suites offer a generous floor plan, complemented with luxurious fittings and an inviting décor inspired by Sabah's rich cultural heritage. Among the most spacious in the region, Ocean Wing rooms are designed with the highest trappings of luxury and comfort. Shangri-La's Rasa Ria Resort & Spa, Kota Kinabalu offers popular western cuisines, as well as Malaysian and Asian favourites. Enjoy all-day dining outdoors or indoors at this engaging spot. International and local dishes are served with plenty of health-conscious menu selections and luscious tropical fruits. Golfers' Terrace overlooks the 18-hole Dalit Bay championship golf course with tended greens, challenging water hazards and an aquatic driving range. Golfers' Terrace is the perfect place to relax before and after a game, with both air-conditioned dining and outdoor seating available at the deli counter. Kozan’s interiors echo the minimalist aesthetics of a classical Japanese Teppanyaki restaurant, with an unconventional architectural design, giving it a modern edge. With Moghul touches hinting at the past splendour of the Maharajahs, the easy elegance of this delightful restaurant creates an ideal setting to savour the refined cuisine of Northern India and spicy specialties from coastal Goa. Oceano is a comfortable and casual fine dining restaurant that offers authentic Italian recipes and farm-sourced ingredients. Makan Street captures the nostalgia of Malaysia’s heritage of street food stalls and open-fronted shop-house restaurants. Each food stall offers tempting flavours and a special glimpse into the cuisines of Asia.